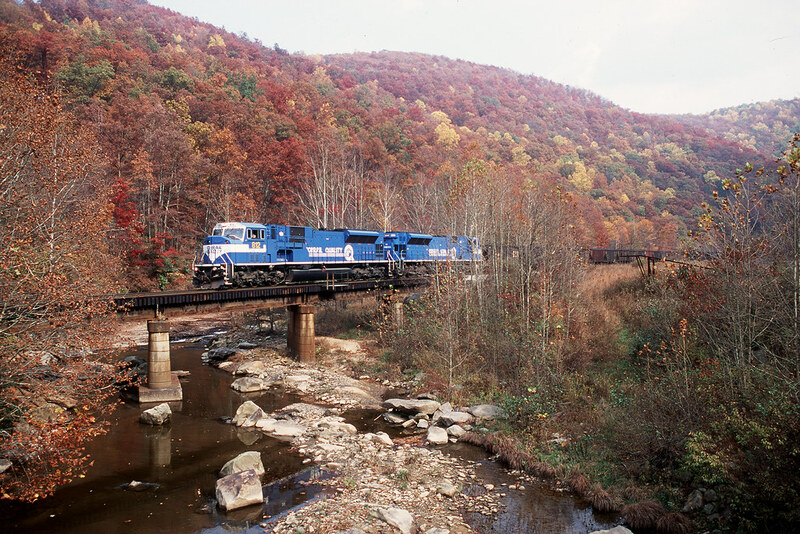 Two former Conrail SD80MACs lead an eastbound CSX coal train over Laurel Creek at the former mine site of Prestonia on the Cowen Subdivision, deep in the heart of West Virginia on October 21, 2000. 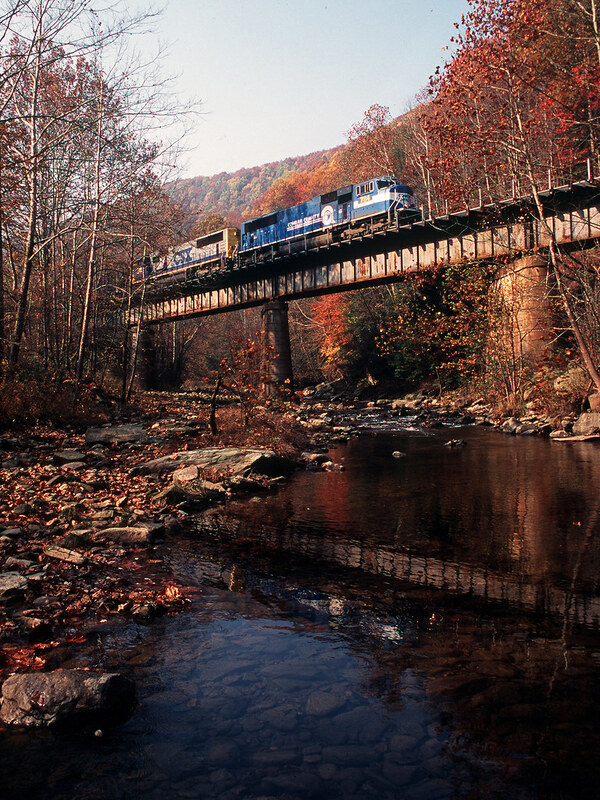 On a bright October morning in 2000, a former Conrail SD70MAC leads an eastbound CSX coal train over Laurel Creek at Centralia, West Virginia. On foggy October morning, a former Conrail SD70MAC leads an eastbound CSX coal train on the Cowen Subdivision near Arcola, West Virginia. 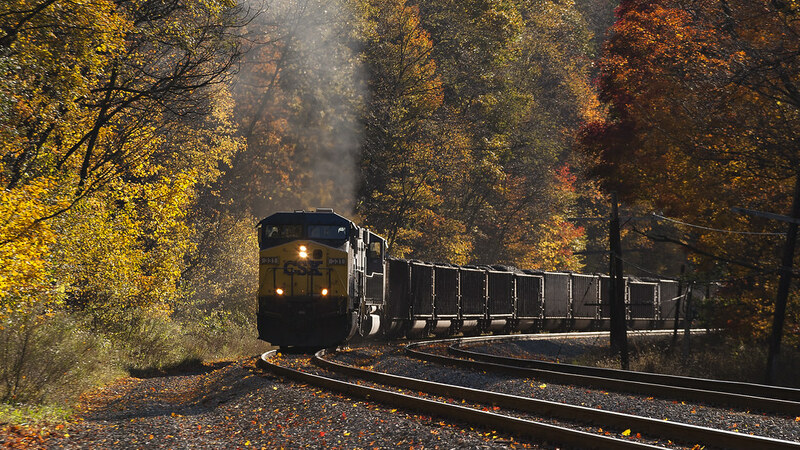 On a late October afternoon, a CSX SD70MAC leads an empty coal train for the Evergreen Mine near the end of the Cowen Subdivision in central West Virginia. 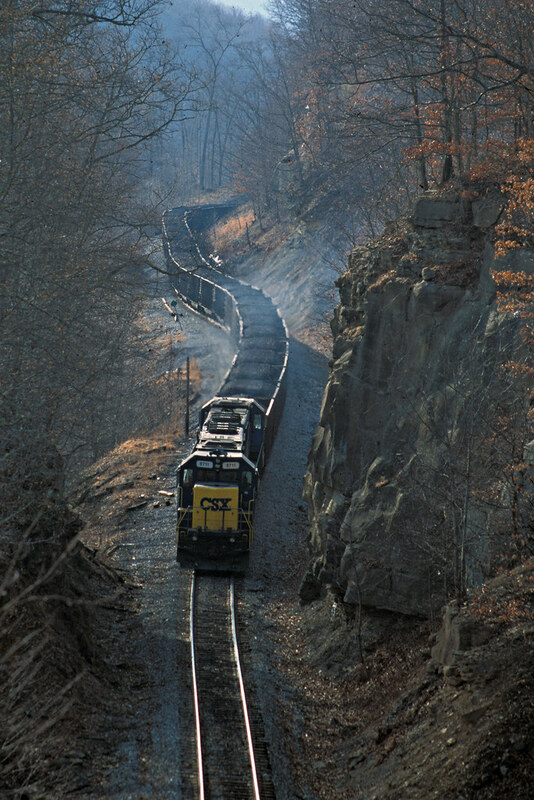 On CSX's remote Cowen Subdivision in March 2001, two SD60s lead a unit coal train upgrade near Frenchton, West Virginia, and through a large rock cut before entering French Hill Tunnel, the vantage for this view. 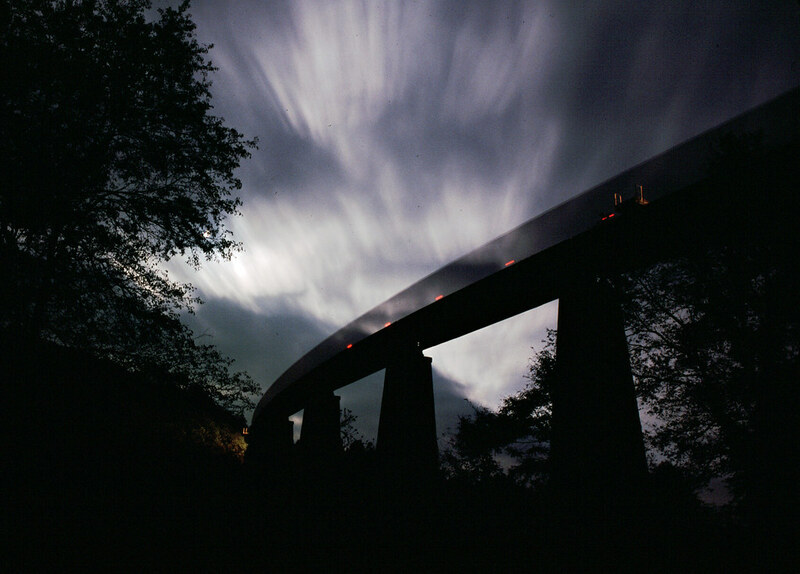 Clouds sweep through a moonlit night as an empty coal train crosses Pleasant Creek trestle on CSX's Cowen Subdivision, seven miles south of Grafton, West Virginia. 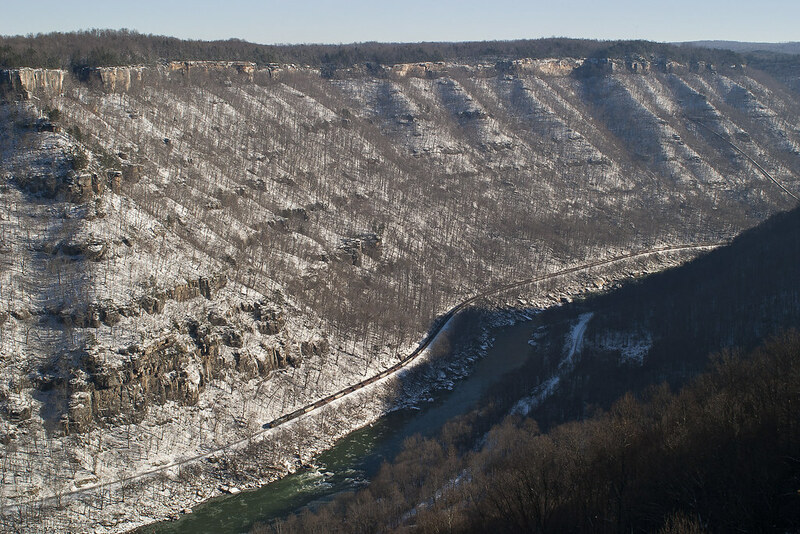 On a bright winter day in 2004, a westbound CSX empty coal train threads West Virginia's New River Gorge, seen from the former mining site of Kaymoor. 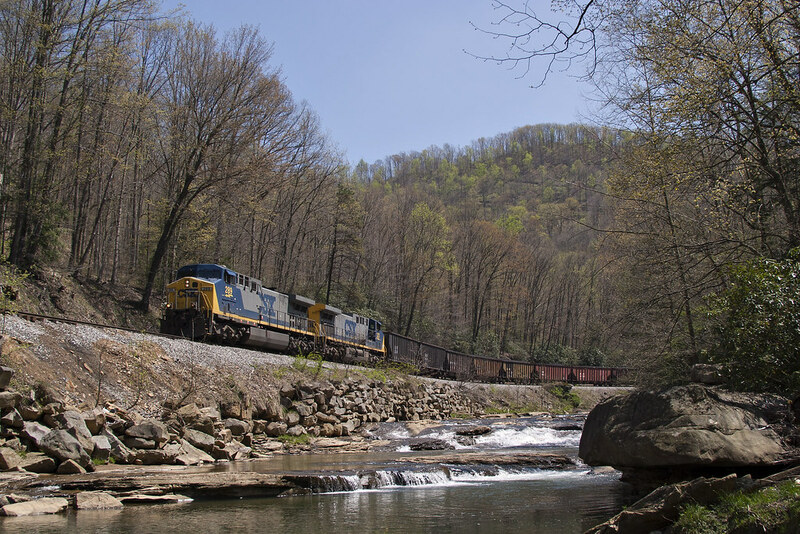 An eastbound loaded coal train on CSX's Cowen Subdivision runs along Laurel Creek just north of Erbacon, West Virginia, on a clear spring day in 2004. 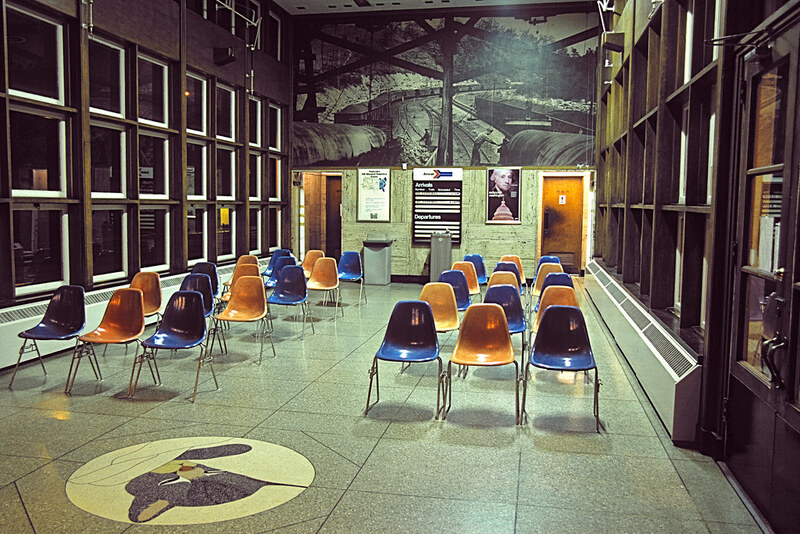 All is quiet in Amtrak's former Chesapeake & Ohio depot in Prince, West Virginia, an hour before the arrival of the westbound Cardinal on an April night in 2004. Two crew members from Amtrak's westbound "Cardinal," train no. 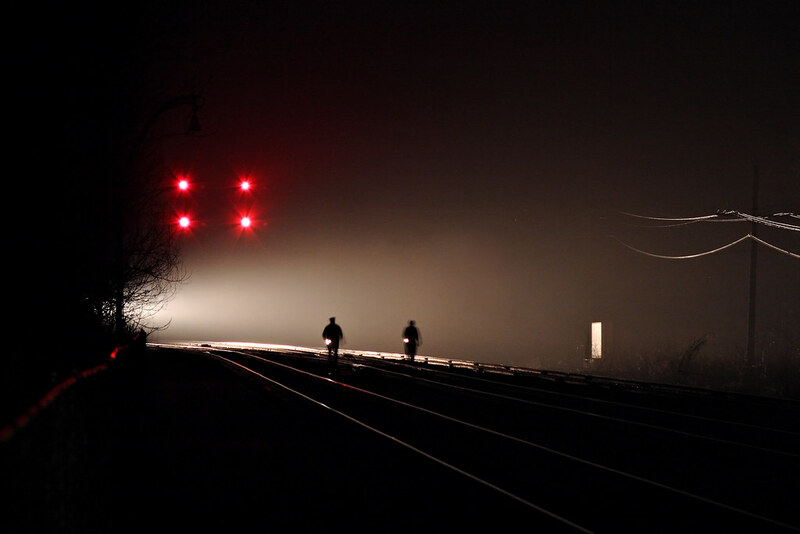 51, walk the train through malfunctioning absolute signals on CSX's New River Subdivision at Prince, West Virginia, illumiated by their train's headlight on the foggy night of April 30, 2004. 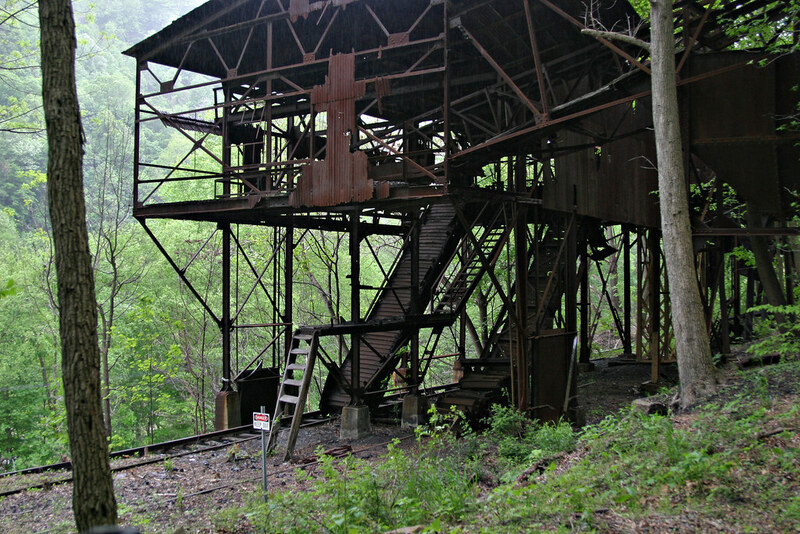 The rusting coal tipple at Nuttalburg, West Virginia, deep in the New River Gorge. 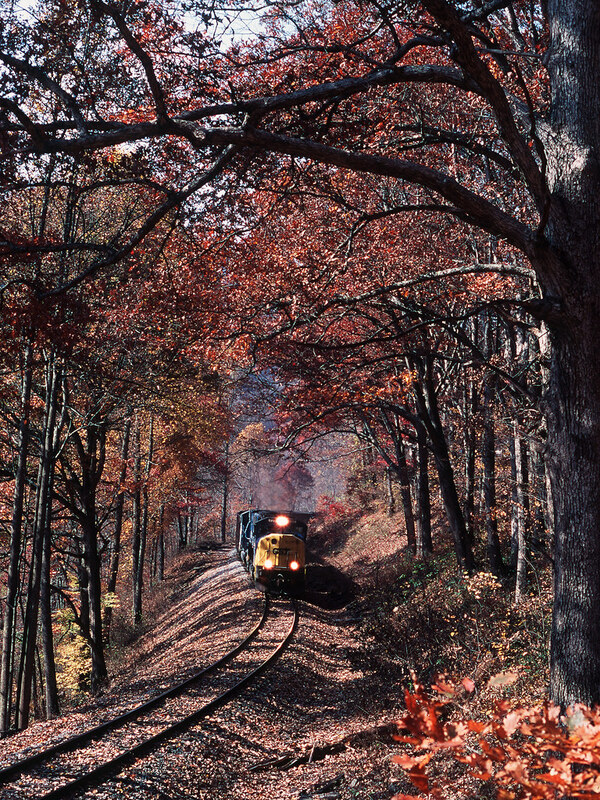 CSX empty coal train passing a farm in the mountains near Adrian, West Virginia, on a bright October afternoon in 2004. 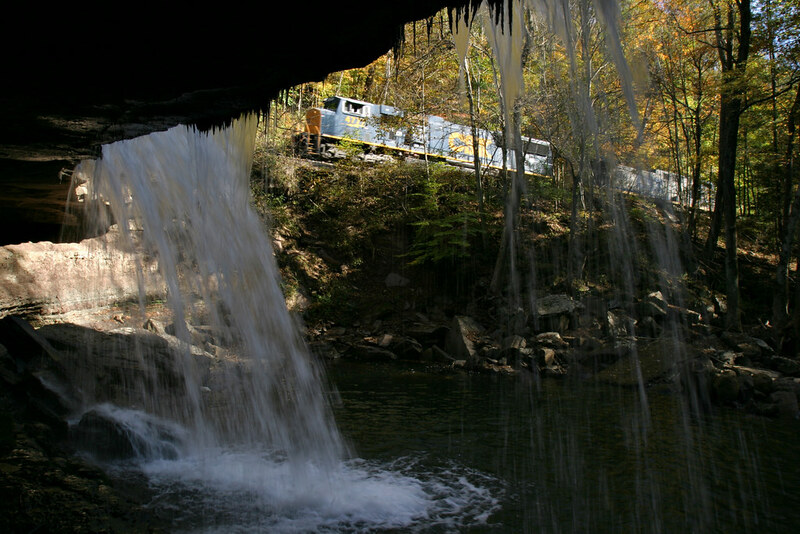 CSX locomotives pass a waterfall on Meadow Creek, near the community of Meadow Creek, West Virginia, in the New River Gorge. The locomotives just delivered the first half of a coal train to the main line junction and are returning to Rainelle for the second half. CSX eastbound unit coal train running along Laurel Creek near Centralia, West Virginia, on the remote Cowen Subdivision. 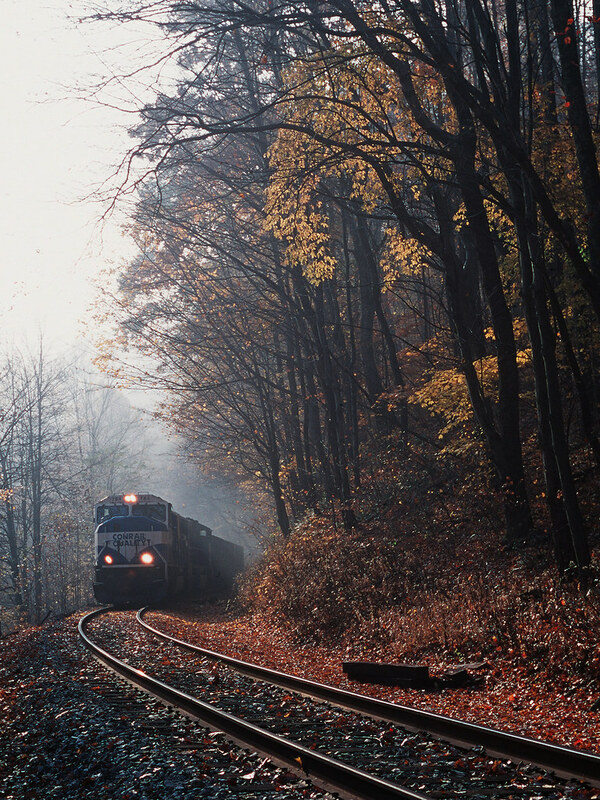 CSX conductor Jeff Conrad puts his coal train together in Cowen, West Virginia, on a dreary fall morning in 2004. 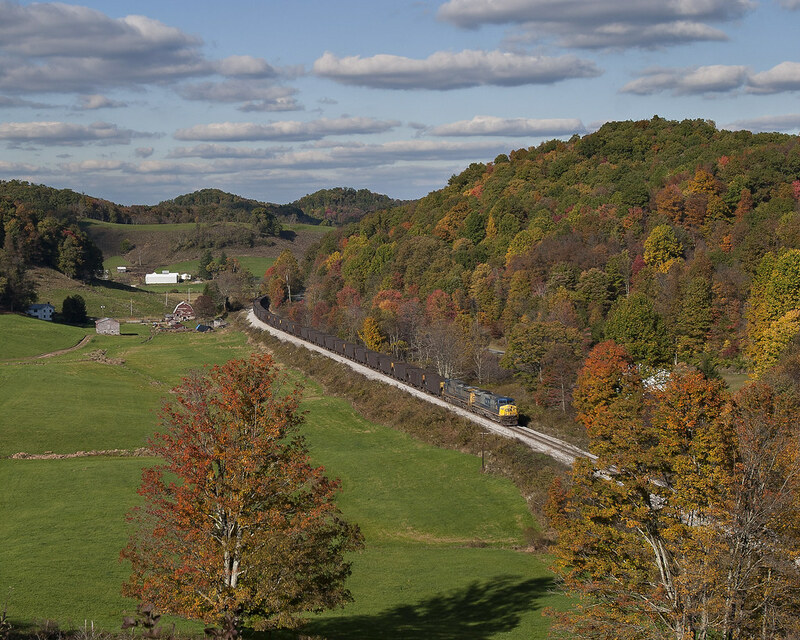 Two CSX diesel locomotives lug an eighty-car coal train up Cranberry Grade near Terra Alta, West Virginia, on the railroad's aptly-named Mountain Subdivision. 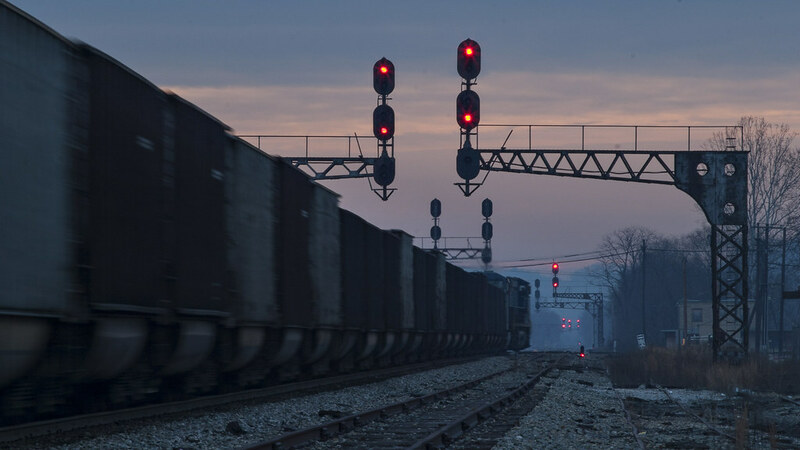 CSX westbound empty coal train passing under the former Chesapeake & Ohio signals in St. Albans, West Virginia, at dawn on the day after Christmas, 2004. 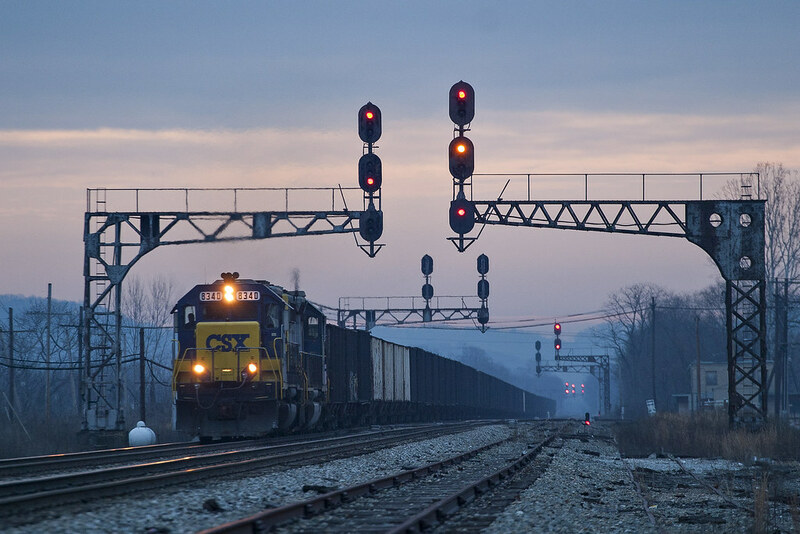 At dawn on the day after Christmas, 2004, an eastbound CSX empty coal train leaves the main line in St. Albans, West Virginia, taking the west leg of wye for the Coal River Subdivision. 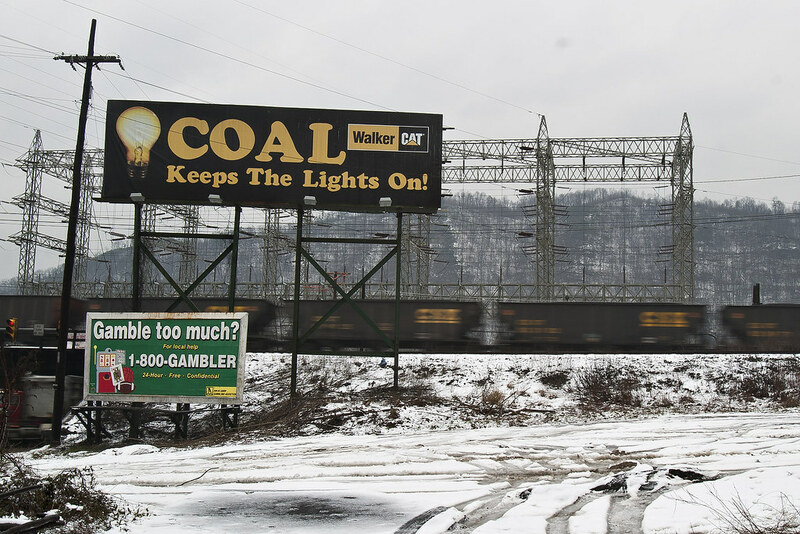 A Walker Cat billboard proclaims the electricity-generating capabilities of coal as a CSX coal train passes behind it on a dreary winter day in Cabin Creek, West Virginia. 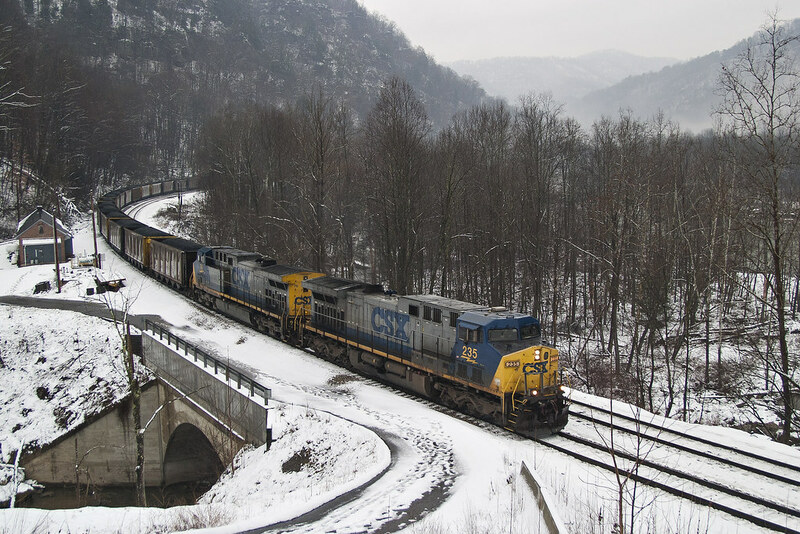 On a dark winter day in 2005, a CSX eastbound coal train rolls along the Kanawha River near Handley, West Virginia. 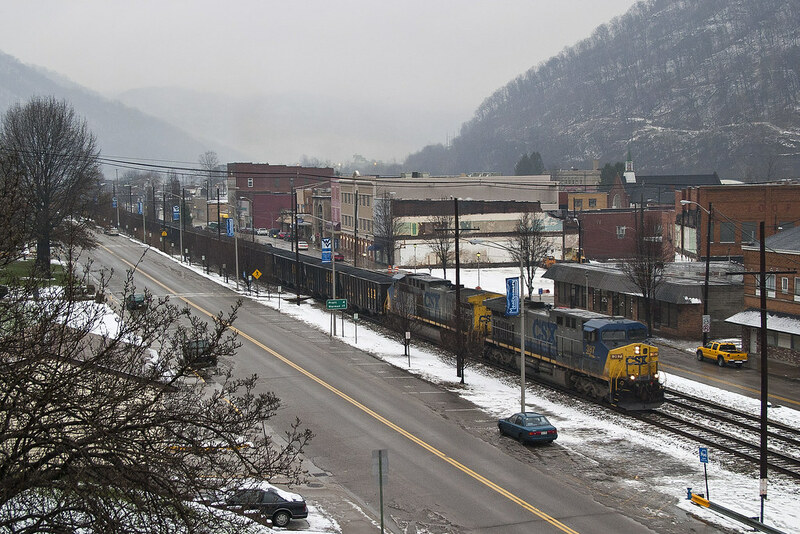 On a gray winter day in 2005, an eastbound CSX coal train threads the college town of Montgomery, West Virginia. 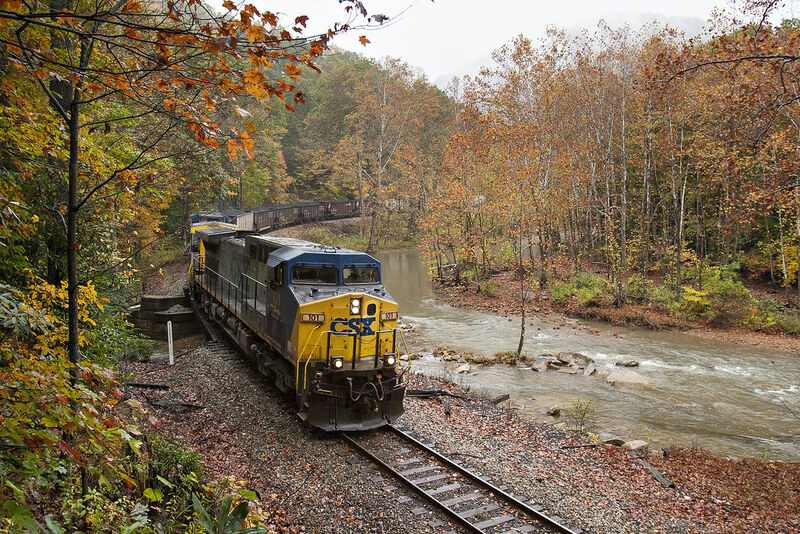 CSX eastbound coal train at Cotton Hill, West Virginia. 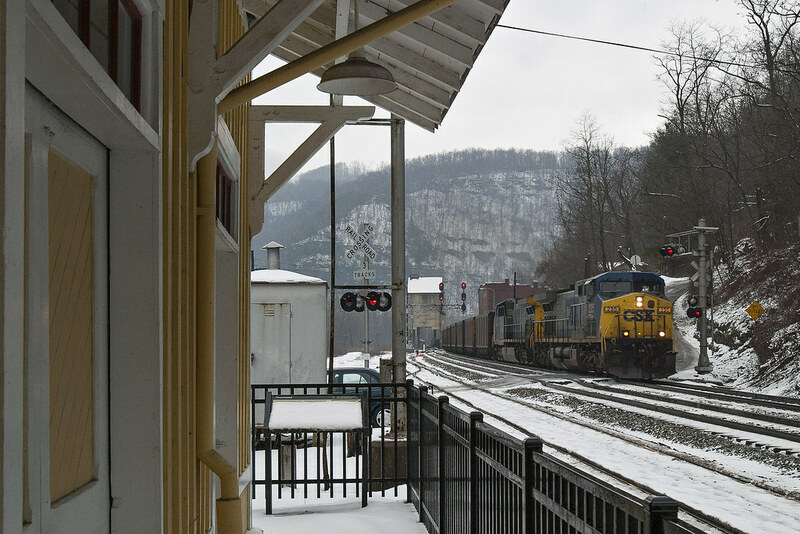 CSX eastbound coal train passing the depot Thurmond, West Virginia, on a dark winter day in the New River Gorge. 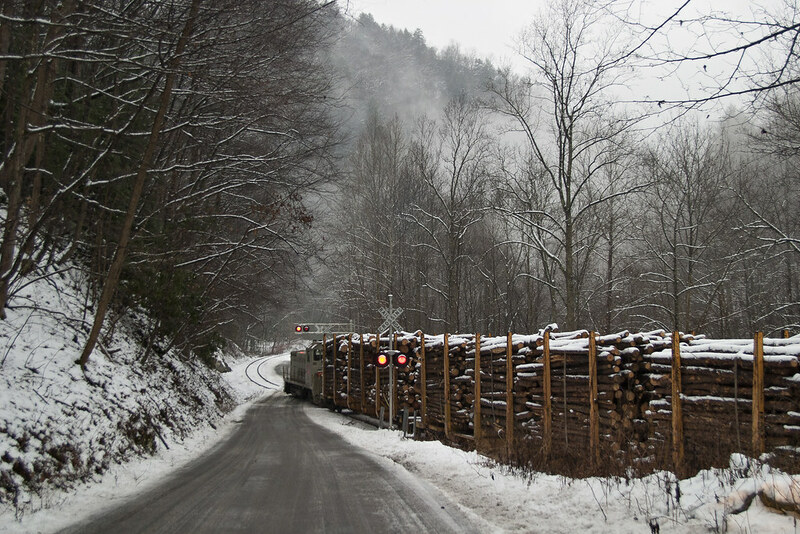 West Virginia Southern's only locomotive struggles to move three loaded log cars up Loop Creek near Thurmond, West Virginia, on a dreary winter day in 2005. 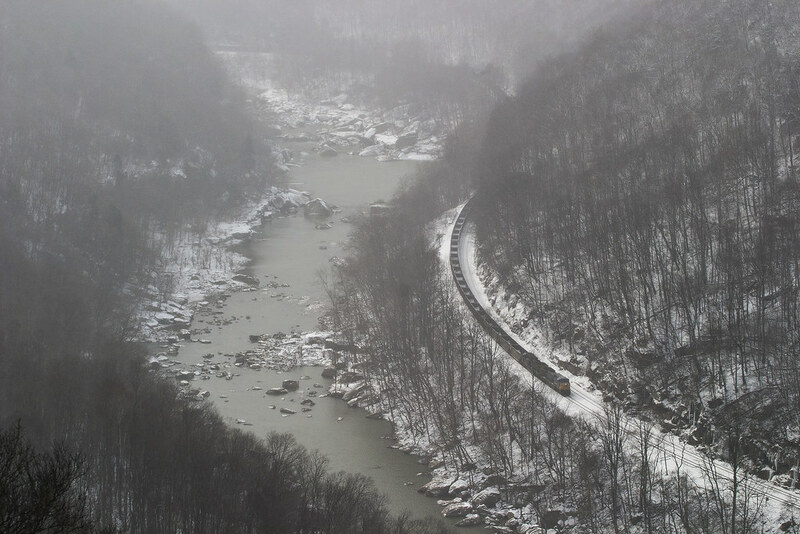 CSX westbound empty coal train in the western end of the New River Gorge near Gauley Bridge, West Virginia, as light snow falls in 2005.